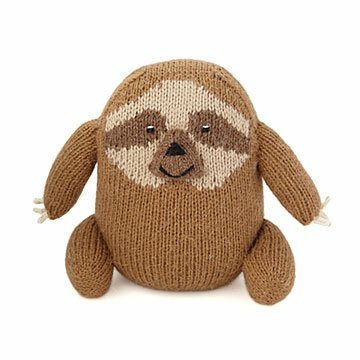 This squishable sloth is hand knit from soft alpaca wool. Baby sloths are called cubs. As if that weren't cute enough to send you down a rabbit (bunny?) hole of baby animal videos, consider the doubly adorable fact that these slow-motion fur balls cling to their mothers for months. Your little one will want to hug this chubby rainforest friend for at least as long. Hand knit from soft alpaca wool, it will become an inseparable, squishable sidekick to all their wild adventures. Peruvian artisans make these plush pals, promoting fair trade and economic sustainability and increasing access to employment, healthcare, and education. And by the way, if you've never heard the aww-inspiring squeaks sloths make, drop what you're doing and Google it immediately. Designed by Manuela Ramos. Handmade in Peru. Manuela Ramos provides artisan jobs to women in Peru's rural areas in addition to campaigning for women’s sexual, reproductive, political, social, and economic rights. The money earned from artisan work is sometimes the only source of income for the women at Manuela Ramos, many of whom live without electricity. Their creative knit work also earns them great respect within their communities, and around the world. The organization gives Peruvian women an opportunity to leave the domestic sphere and “build a relationship with the world,” so that they can realize their full potential and exercise their rights as women.